it's been weeks since i've posted here. how are you doing? nothing new on my end here; just a lot of new recipes i've been trying and photographing. i'm really hoping that you'll find them here soon once i get back into my groove! i'm out of town for the weekend (back to san luis obispo, i'm so stoked! ), so I figured I'd post something here before I lag again. 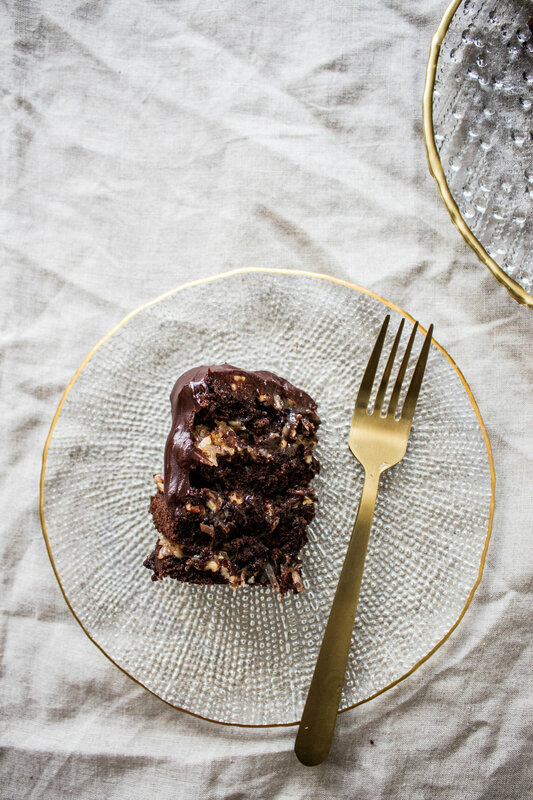 here's your quick update: a german chocolate cake! 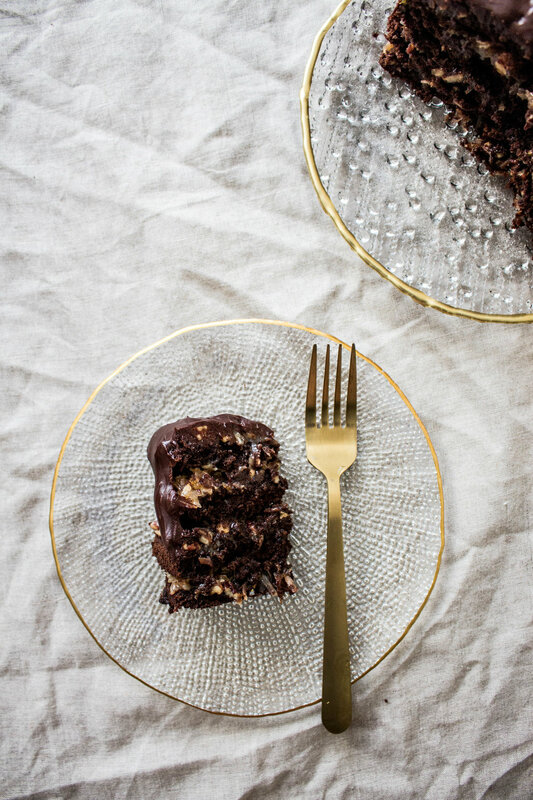 Think this: a rich, moist, chocolate cake, layered with a caramel-pecan-toasted coconut filling, and topped with a silky chocolate ganache. chocolate on chocolate, mixed with a gooey coconut-pecan filling. c actually requested this when we first started dating, a little over two years ago. and voila, timely me finally made this cake per his request a couple months ago. in my defense, a german chocolate cake just did not sound appealing to me- coconut and pecans covered in goo, layered between chocolate cake. also, it just seemed like a lot of work. and it is- it takes an extra step to make the filling, but i think it's a nice change from your typical buttercream. it takes a couple steps to put it all together, mostly just an extra step from your normal cake because of the filling. you toast the nuts and shredded coconut before mixing it with your brown butter caramel filling. totally worth, and it smells so good. baker's notes: the chocolate ganache is completely optional. there didn't seem to be enough filling, and I didn't want to make more because more work and also what i had seemed like a good proportion. frosting your cake with chocolate buttercream is an option if you wish, but i prefer the ganache route for a darker chocolate flavor and a more aesthetically-pleasing cake. make the cake: preheat the oven to 350 f. grease and flour two 6-inch cake pans, and line the bottoms of the pans with parchment paper rounds. place the chocolate chips in a medium bowl. pour the hot coffee over. let it sit for a minute, then whisk until smooth and chocolate is melted. stir in the buttermilk (might look a bit chunky but it's ok and do your best); set aside. in a clean medium bowl, beat the egg whites until stiff. set aside. in a large bowl, beat together the butter, sugars, and salt until fluffy. beat in egg yolks and vanilla until smooth. stir in the buttermilk-chocolate-coffee thing from earlier. add the baking soda, and beat to combine. add the cocoa powder and flour, and fold in until no flour streaks remain. fold in a quarter of the egg whites to loosen the batter. fold in the rest of the egg whites until no whites remain. don't overmix! divide the batter between your prepared baking pans. bake the cakes for 24-26 minutes, until a toothpick inserted in the center of the cake comes out batter-free. immediately run a knife around the cake, let the cakes cool in the pans for 10 minutes before turning over onto a wire rack to cool completely. leave the oven on if you are making the filling next. make the filling: take two small baking trays- spread the pecans on one and the spread the pecans on a small tray and the shredded coconut on the other. bake both trays in the preheated 350 f oven. the pecans will take about 10 minutes, and the coconut about 15 minutes. stir halfway through to make sure the pieces don't burn and brown easily. pour both the toasted coconut and pecans into a bowl and set aside. in a large saucepan, brown the butter by melting the butter until brown bits form at the bottom of the pan and it starts to smell nutty. Pour the browned butter into a small dish to cool slightly. in another saucepan, whisk together the egg yolks, half-and-half (or milk + cream mixture), sugars, and salt. while whisking, drizzle in the slightly-cooled browned butter. heat the saucepan with the mixture over medium-low heat, stirring consistently so that it doesn't burn at the bottom. heat the mixture until it's thick enough to coat a spoon. be sure to not let it boil. remove the pan from the heat, and stir in the vanilla. pour the mixture over the toasted pecans and coconut, and stir to combine. let the filling cool before using it for the cake. the filling may seem runny, but it will thicken as it cools. assemble the cake: cut the cooled cake layers into two thinner layers. a sharp serrated knife is good for this. place one layer on a cake plate or cake stand. scoop 1/4 of the cooled coconut-pecan-caramel-ly filling onto the center of the cake. use a butter knife or offset spatula to push the filling to the edge of the cake. repeat for the remaining layers, and place the last scoop of filling for the top of the cake. if you want to top the cake off with chocolate ganache: place chocolate chips in a medium bowl. boil 1/4 cup of heavy cream in a small saucepan, and pour over the chocolate chips. let the mixture sit for a minute, then stir until the ganache is silky and smooth. pour the ganache over the top of the cake (over the filling), and using an offset spatula, push the ganache to the edges of the cake so it drips down.